Easily manage and organize iCloud photos as you wish. 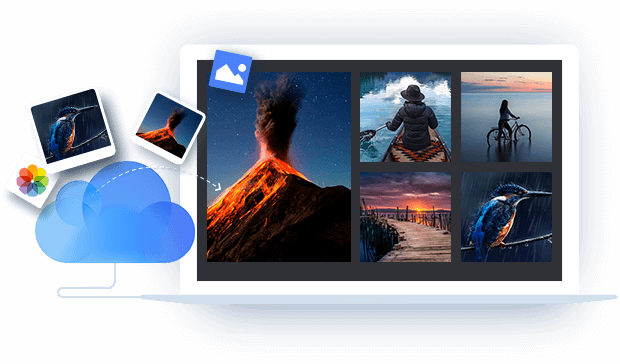 Download and upload photos between iCloud and PC with ease. Bulk delete photos from iCloud and all synced devices. Simply add any photos on iCloud to any Albums in your way. 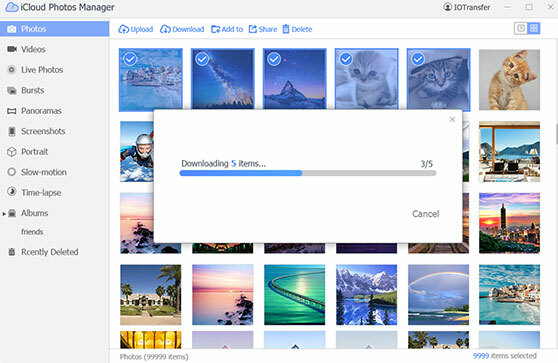 Easily download photos from iCloud to PC for backup with IOTransfer iCloud photo manager. No need to save photos to computer one by one. Export iCloud photos to computer to save your sweet memories forever. Directly upload photos from computer to iCloud with just by dragging and dropping. Effectively avoid uploading duplicate photos to iCloud. The uploaded photos are displayed both in the current album and the Photos library. Bulk delete photos from iCloud and all synced devices with ease. Batch deleting albums in iCloud is also available for you. Easy to recover recently deleted photos to retrieve the accidentally removed images. Organize and display iCloud photos using Albums. Simply add any photos on iCloud to any Albums as you wish. 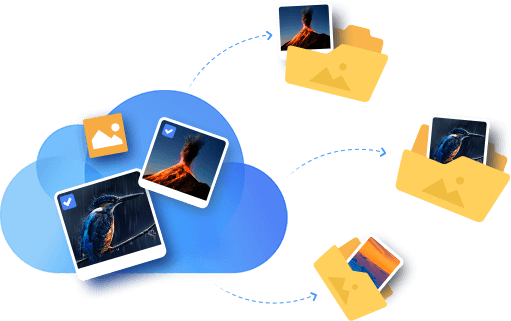 Easily manage and categorize iCloud photos in your way. 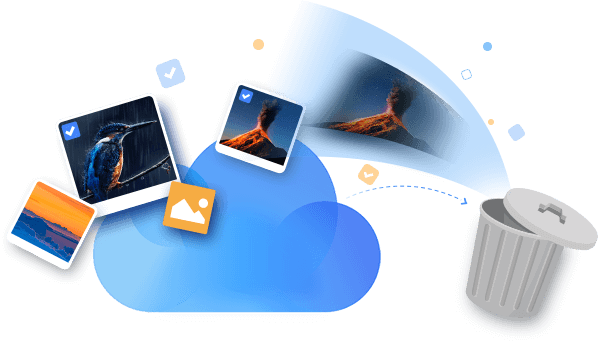 Display all iCloud photos in up to 10 photo categories, such as Photos, Videos, Live Photos, Bursts, Panoramas, Screenshots, Slow-motion, Time-lapse, Albums, Recently Deleted. Easily navigate to the photos you're looking for. 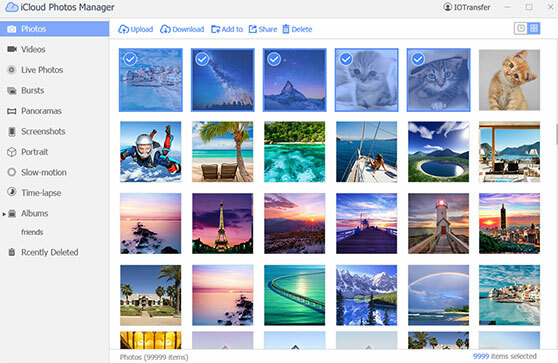 Manage and organize iCloud photos in any category you like. Simply batch transfer photos from iPhone/iPad to computer for backup. 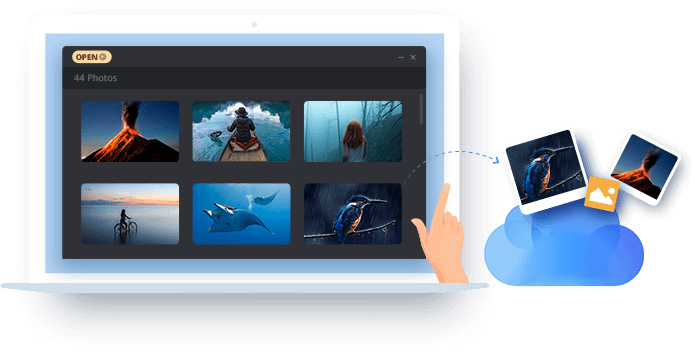 Easily import photos from PC to iPhone/iPad and enjoy them everywhere. Select multiple iPhone images to bulk delete photos with just one click. Remove photos in bulk via IOTransfer to free up storage for iPhone/iPad. Wirelessly transfer photos between computer and iOS devices over Wi-Fi with IOTransfer and AirTrans app. No need to fetch a USB cable. Easily and quickly create animated GIFs with your iPhone photos and images. Transfer GIFs between iOS devices and computer as you wish. 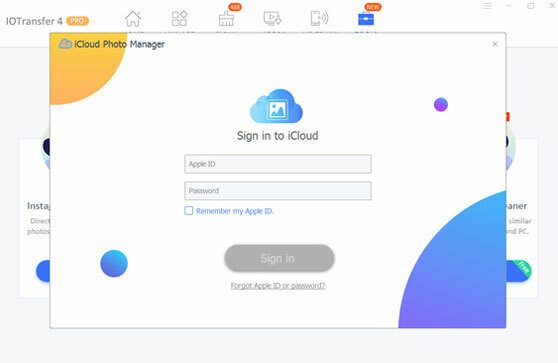 Log in iCloud Click “TOOLS” at the top and tap on “Launch” under “iCloud Photo Manager” to log in iCloud with Apple ID and password. Select iCloud Photos Select any iCloud images from the list of photo category in the left. Start Downloading Click “Download” icon to start downloading iCloud photos to computer.